Ben Law built his woodland home from roundwood in his own woods from his own timber. It was famously filmed by Kevin McCloud's Grand Designs team for the UK's Channel 4. Since then he has built more houses, barns, workshops, even his local village shop from local roundwood and natural materials. In chapter 1 of this book Ben tells his story from bender to woodland home and gives an introduction to the materials and their merits. In chapter 2 he writes about managing woodland for roundwood production with chapter 3 discussing the tree species suited and not suited for the job. 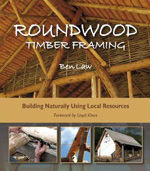 Chapter 4 covers the tools you'll need to build a roundwood building all well illustrated. Then we get to chapter 5, construction, the straps and pegs (nuts and bolts) of the book which details the pillar foundations, frame, joints and frame raising. Again all beautifully illustrated with clear pictures and drawings. Chapter 6 then deals with the roof, floor and walls using shingles, wool, straw, lath and clay & lime plasters. Finally chapter 7 is a presentation of the elements of the buildings Ben has built since his own home in Prickly Nut Woods. 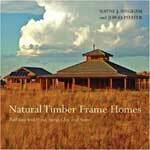 All in all a beautiful book that will inspire and enable you to build your home. 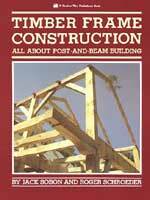 The book breaks the timber framer's art, and science, into discrete chapters, each with a clear focus and gives each adequate coverage. All recommendations given in the text are well supported by the "whys and wherefores" and the more technically inclined will find thorough analyses of each aspect of frame design and practice. 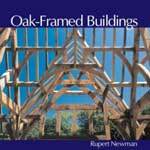 If you are interested in learning more about green oak frame design then 'Oak-Framed Buildings' by Rupert Newman is a good place to start. The book is beautifully illustrated throughout with diagrams and pictures showing examples of ancient and new homes in both interior and exterior views. The book begins with a short history of timber framing and moves on through sighting the building e.g. making a site map, site orientation, room location etc. It goes on to cover designing the frame (with clear diagrams showing component parts like jowl post, tie-beam, arch brace etc. ), the structural quality of oak, cutting the frame, the tools and techniques, raising the frame and finally building the envelope (the roof, walls and floor). 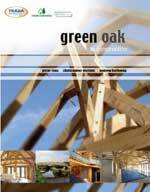 The book is a mixture between a coffee table book and a very practical guide to oak framing. A highly illustrated technical guide celebrating the use of oak in the building of modern structures and showing how to achieve excellence in practice. Its key features are: eleven case studies demonstrating best practice and inspirational design; design data and grading rules, compiled by an expert author team; and, numerous colour photographs and diagrams. For those inspired not by a technology-governed and energy-intensive world, but instead developed organically in response to the places in which we live. Through beautiful photography and informed text, it explores the quiet splendour of traditional timberframe homes built with straw bales and plaster or clay-finished walls. 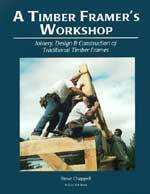 Discusses the basic tools and techniques of timber framing and provides instructions for building timber frame houses, sheds, barns, and garages..
With 259 colour photos, diagrams and formulas that will take the novice or experienced builder from house plans to cordwood home occupancy. 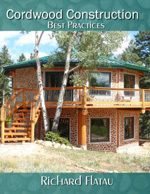 Sections include: mortar mixes, R-values, code compliance, types of wood, drying wood, shrinkage tables, foundations, how we became mortgage-free, post & beam framing, formulas for estimating materials, homeowners insurance, Cordwood Conferences 2005 & 2011 summary, Best Practices with cordwood construction, lime putty mortar, cob, paper enhanced mortars, Permachinking walls, building codes, colour photo album, making stained glass bottle ends, how-to �mortar-up� a cordwood wall, tuck pointing, FAQ�s, maintenance, weight of a cordwood wall, cost analysis and more. This well illustrated book will inspire designers and help owner-builders decide whether cordwood masonry is appropriate for their building plans. Within the examples shown it explains the variety of ways of building with this product, from using paper-enhanced mortar, cob or stone. 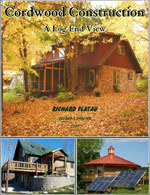 This book recounts the author's adventures in building a rectangular, three bedroom, 2100 square foot home. The first section deals with the lessons and triumphs learned by a novice, building a home. Cost estimates, practical suggestions, line drawings, photos and anecdotes are included. Sketches of cordwood pioneers, Jack Henstridge, Rob Roy and Cliff Shockey are shared. 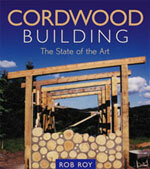 The main portion of the book deals with the 'nitty gritty' of cordwood construction: types of wood, types of walls, foundations, zone and code onsiderations, mortar mixes, formulas for estimating approximate amounts of wood, mortar, sand and sawdust, the proper method for laying up a wall, random patterning, cutting, barking and drying wood, electrical, plumbing and roofing. The book ends with recommended reading, website, blogs and other useful resourses.